The HTC One Mini has been officially unveiled as the pint-sized version of the Taiwanese firm's show-stopping HTC One flagship device. Obviously the clear rival to the One Mini is the Samsung Galaxy S4 Mini, and that means you can expect the same level of cut down specs in HTC's latest offering. What you get is a 4.3-inch 720p display, 1.4GHz dual-core processor, 1GB of RAM, 16GB of internal storage, 2um (UltraPixel) rear camera (4MP in old money), 1.6MP front cam and 4G connectivity wrapped in a mainly metallic body with a plastic frame keeping the front and back together. That means it's got a roughly similar look and feel to the HTC One, which is certainly a good thing in our book, and with vital statistics of 132 x 63.2 x 9.25mm and 122g it should fit nicely in your palm. In terms of the other goodies you can expect to find inside the One Mini it comes running Android 4.2.2 Jelly Bean with HTC's Sense UI splashed on top, including the new BlinkFeed news aggregator which debuted on its bigger brother. We're a little worried about the 16GB of internal storage considering there's no microSD slot, something the S4 Mini does have, and the fact HTC has popped its Zoe and Highlights features into the One Mini which are a little storage hungry. As with the flagship model, the HTC One Mini comes with dual front-facing speakers complete with BoomSound technology, plus there's Dr Dre's Beats Audio tech also embedded into the handset allowing you to blast your tunes. 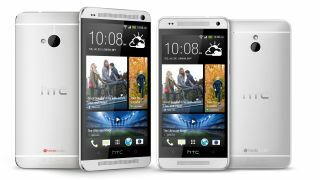 In terms of a HTC One Mini release date the handset is expected to go on sale sometime in August, and we've been told, for the UK at least, that it'll probably be available for free on contacts from £25-£27 per month. HTC is a little more vague on the U.S. front, with a note that specific pricing and availability "will be announced later this summer." We've already been lucky enough to spend some time with the handset, so make sure you check out our hands on HTC One Mini review to find out what we make of it.